Tungsten has proved to be highly suitable for surviving the extreme conditions that will prevail in the nuclear fusion reactor ITER. Even during sudden energy pulses the intended wall material for the reactor remains intact. That is apparent from research conducted at the PSI lab of FOM Institute DIFFER. For the international nuclear fusion project ITER, DIFFER is investigating how tungsten behaves under the extreme plasma conditions in the exhaust of the fusion reactor. This exhaust, or divertor, will have to cope with a bombardment of heat and particles. In addition to the continuous bombardment by particles the wall will be subjected to energy pulses that are ten to one hundred times more intense than the already violent particle bombardment. The energy pulses, called Edge Localised Modes (ELMs), are sudden and highly localised eruptions of energy from the plasma. During a fraction of a second the heat flux on the divertor surface affected rises up to a gigawatt per square metre. The ELM eruptions follow each other in a series of energy flashes. To simulate the ELMs, the researchers expanded their linear plasma experiments Magnum-PSI and Pilot-PSI with a capacitor bank. Using this they could expose the tungsten to a mix of 23 minutes of ITER-relevant plasma and more than 9000 ELMs with a peak capacity of 0.7 GW/m2. What happened? Although the bulk tungsten survived the extreme conditions, strong surface reshaping was observed on the millimetre scale. Also, the surface temperature of the tungsten blocks peaked higher during successive identical ELM pulses. This shows that thermal properties within the tungsten are changing, which points at the need for active control of the ELMs. The researchers will now continue with their research. At the new location of DIFFER in Eindhoven, Magnum-PSI will be expanded with a superconducting magnet. 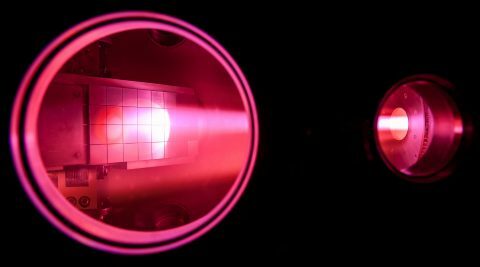 This will be able to produce plasma for many hours and that will enable unique long-term measurements. Tungsten elements for the ITER reactor wall are exposed in Magnum-PSI to a hot, dense plasma. DIFFER is investigating whether tungsten can be used as a wall material for the future ITER fusion reactor. Besides the continuous stream of charged particles the plasma also produces sudden, violent energy pulses. So far tungsten seems to be able to withstand both the bombardments and pulses.